Designed and developed with the sophisticated driver in mind, the Comfort Sport Damper provides increased handling and a more stylish appearance; while retaining a smooth civilized ride. The Comfort Sport Damper features TEIN’s latest technological innovation, the Micro Speed Valve (M.S.V. 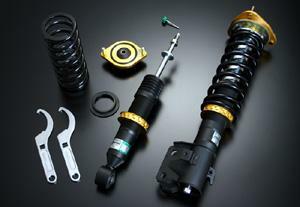 ), improves overall traction and steering response by precisely controlling the internal flow of oil. The smooth, sleek black shell case is coated with a special fluorocarbon resin for superior resistance to corrosion. Gold alumite spring seats and locks distinguish the Comfort Sport dampers from competitors and ensure a simple, hassle-free adjustment; every time. By using popular sized wheels and tires to develop the Comfort Sport damper, we are able to accurately determine the optimum spring rates and damping to achieve a perfect balance between comfort and performance.